If you’ve worked within the photographic industry for a number of years, you will most likely have heard the objection ‘you’re too expensive’ at some point in time. Your first reaction may be to feel offended or to rush into justifying your fees, however sometimes clients have a valid reason for thinking this way – mainly because of preconceived notions about the industry and the value of your services. Before you go off in a huff or rush to find a defence, take some time to uncover why your clients feel and think that you are too expensive. The first thing to realise is that price is considered a reflection of value. Clients consider your fees a ‘great price’ when the value is higher than the price, however it’s considered ‘overpriced’ when the price outweighs the potential value. Getting the delicate art of price/value balanced can take quite a while, but the main thing to be aware of is that clients can go to Google and find twenty photographers that are cheaper alternatives so if you are charging a premium rate you have to be offering a premium service. However, you should never lower your rates just because you hear ‘you’re too expensive’. If you offer a lower discounted fee just because someone makes a comment, they will automatically believe that they can negotiate a discounted rate by pushing you harder. This is why it’s important to take the time to find out the real reason why your potential clients are apprehensive towards your prices. WHAT ARE THEY COMPARING YOU TO? Any client that is serious about hiring a photographer will have ‘shopped around’. This is perfectly natural but will most likely affect your clients expectations when it comes to your pricing. You cannot control what a fellow photographer is charging, however you can explain to your clients why your rates are higher. If a client is still not interested in paying your rates, even after hearing about the service they will receive, then you can only move on and find other customers who are willing to pay. If you present your client with an hourly rate it might freak them out. However if you ask them what their budget is they can give you a concrete figure. For example if a client’s budget for a wedding photographer is £3000 then you can explain to them what can be accomplished within that budget. This way expectations for your client can be laid out from the beginning, meaning there are no misunderstandings. Equally, if you find that a client has not yet settled on a budget they most likely are not ready to invest in your services and therefore are possibly not worth pursuing at this time. DO THEY REALLY NEED YOUR SERVICES? 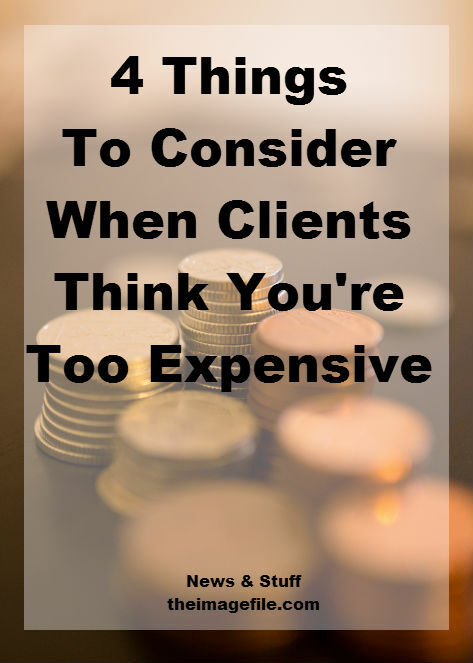 Sometimes clients use the phrase ‘you’re too expensive’ because they’re looking for an easy way out of the conversation. This normally occurs when a client is not ready to make a decision but doesn’t want to say no. Mentioning the cost of a service is the easiest way to back out – for example ‘I’m not getting married until 2017 so it can wait’ or ‘our schedule is so tight at the moment I just don’t know when we can attend the session’. If a client responds with comments similar to the above, then suggest that they get in touch with you in the future when they are ready to take on the project. ARE THEY EVER GOING TO ACCEPT YOUR FEES? There will always be some clients who do not understand the value of professional photography however well you explain your services, and therefore will not understand your pricing. In this situation it might be best just move on. The next conversation could be with someone who appreciates the creativity, effort and skill that you put into your work. How do you react when a client tells you ‘you’re too expensive’? Is there a reaction that works particularly well for your client base?